Previous: Should you try to prevent spoilers in your voting system? Hi, my name’s Mitra and I run Foreverbird Studio. I’ve been working on the creative design for VoteUp, and in the process I’ve become a VoteUp user. Chris has invited me to share some of my experiences using VoteUp. Recently Kiran contacted me to help her with a new logo. Her business was in the startup phase and she was in the process of deciding on the name, logo, and tagline. We created 3 logo concepts and got feedback from her contacts using the VoteUp App. In the end Kiran was able to making a confident decision about her logo choice. Each logo design project has a story. For Kiran the logo design process started over a year ago. In the last year she had decided to make a business name change and remained unconvinced that her existing logo had the right tone. Our first step in creating a new logo was to select 3 sketches with different looks. We choose 3 logo templates from Envato as a starting point; Tropical, Waiter, and Juice Bar. The next step was to get some feedback from Kiran’s friends about the sample logo designs. My suggestion was for her to download the VoteUp App on her iPhone to help with this process. Together we added thumbnail images and descriptions to her poll. She accessed her contact list and added about a dozen friends to her poll. In less then 30 min. Kiran was receiving feedback from her friends about what logo they liked best. Mobile polling, like the VoteUp App, is a convenient and quick way to get feedback and make better decisions. Kiran had a few concerns about the results from her first poll on VoteUp. She didn't have an opportunity to talk to her contacts about significance of the logo designs and she realized that was really important to her. She decided to do a second poll after talking to her friends about the meaning of each logo. The results of the second poll ended up being significantly different. After talking to her contacts and reviewing the designs Kiran has made a confident choice in her design. She is going with the pineapple! Did you know that the pineapple has been a universal symbol of hospitality and welcome for many centuries all over the world? Surve-stuff is a business that offers high end server accessories. Hospitality is a key essence to the industry and that makes the pineapple a perfect logo for Kiran’s business. 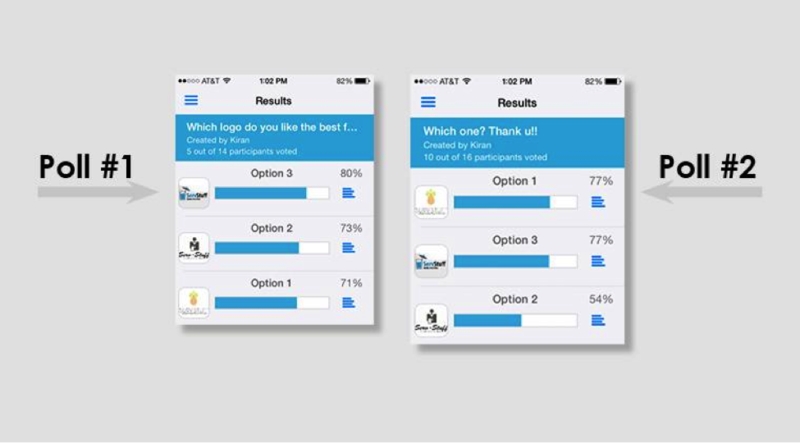 Using a mobile poll was a quick and easy way from Kiran to get the process of selecting a new logo started. It provided her with feedback from her contacts as well as giving her insight on her feelings about the significance of hospitality in her business. She now has a new tool, the mobile voting poll, that she can use anytime she needs feedback on her project. As a graphic designer, I highly recommend using the VoteUp App in your logo design process to make better decisions. VoteUp was an instantaneous way to get an idea of how your friends feel about anything you want a consensus on. It was amazingly quick and to the point. Very easy to use and super cool because everyone can see the results after you end the poll. Very fun app! !